EMPOWERMENT ACADEMY is a BEAUTIFUL,PEACEFUL AND TRANQUIL VENUE that is ideal for an array of corporate conferences, training, events, exhibitions, product launches, parties, workshops, seminars and meetings. The venue is located on a small holding in Shere, PRETORIA EAST, only 2km from the modern Hazeldean shopping centre (Silverlakes area). Travelling the 62km from OR Tambo International Airport is easy when taking the new eight-lane R21, then on to the N1 and N4 (also refer to map). Although the Empowerment Centre does not offer onsite accommodation, DARK CHOCOLATE GUESTHOUSE is a mere 200m from the venue, there are also a number of other establishments in the area, ranging from lodges to 5 star Hotels within a few kilometres. The Empowerment Centre boasts top class EXECUTIVE CONFERENCING facilities within a serene atmosphere that is conducive to teaching and learning. 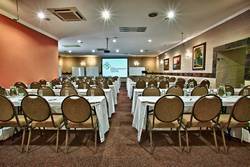 There is a choice of comfortable, upmarket and well-equipped rooms with STATE OF THE ART EQUIPMENT which can accommodate from 8 to 180 people, not to forget the available FREE AND SECURE PARKING! We also cater for a vast array of other events such as year end functions, birthday bashes, reunions, etc. NOW ALSO WEDDINGS! FLEXIBLE and competitively priced PACKAGES, coupled with our extensive menu selection, mouth watering cuisine, bar facilities and superior service guarantees you an exceptional and unforgettable experience!